Our Luxurious, Privately-owned, Oceanfront, NO-SMOKING(even on the Balcony), 2 Bedroom, 2 Bath Condo is on the 10th Floor of the Sand Dollar Condominium at 3115 S. Atlantic Ave. For the Vacation of a lifetime, this unit is waiting for you. Sorry, but the Sand Dollar does not allow Pets of any Kind. ***** WEEKLY RENTALS: SATURDAY to SATURDAY, except for NASCAR & BIKE WEEKS. Minimum Rental Period is 7 Days. We do not do Monthly Rentals in February through August. PLEASE E-MAIL YOUR VACATION DATES FOR A PRICE QUOTE. AIRPORTS: Only 8mi/12km from Daytona Intl. Airport and 73mi/120km from Orlando Intl. Airport. LOCATION: We are within 75 minutes of most Central Florida Attractions, such as Disney World, Sea World, Universal Studio, Kennedy Space Center and much more. ACTIVITIES: We are only 60 to 75 minutes from Disney, Universal Studios, Sea World and all the other Orlando attractions. Only about 45 minutes from the Kennedy Space Center, historic St. Augustine and the Golf World Hall of Fame. Daytona has many great Golf Courses at reasonable rates, Tennis, Deep Sea Fishing on a Party or Charter Boats, Boat trips on the inter-costal water way, Para Sailing, Jet Skiing, Horseback Riding, Greyhound Racing/Poker, several fine Museums, great Waterpark, largest Harley Davidson Dealership in the world, Historic Ponce de Leon Lighthouse, Tanger Outlet Mall, Famous Daytona Flea Market, many great restaurants, LPGA National Headquarters and of course, the Daytona USA Museum with tours of the world famous Daytona Motor Speedway and much more. BUILDING: FREE Wi-Fi, Security System, Central Alarm/Smoke Detectors/Sprinklers, 2 High Speed Elevators, 2 Saunas, Heated Oceanfront Pool/Hot Tub and Shuffle Board, Oceanfront Picnic area with Gas BQ Grill, Exercise Room, Underground Garage with 7'door. WE DO NOT HAVE A KIDDY POOL and Infants with Diapers of any kind are not allowed in our Pool or Hot Tub by Order of the Health Dept. UNIT has Electronic Air Purification System, Central AC/Heat, 4 Telephones/Answering System, Ceiling Fans through-out and a Computer size Guest Safe for your Computer and/or your valuables. LIVING/DINING AREA has a very large Private Balcony overlooking the beautiful Atlantic Ocean, a Queen Sleeper Sofa, Dining Table/4 Chairs, Breakfast Bar/2 Stools, 32' HD TV/Cable, DVD/VCR Player, Stereo system with CD Player and AM/FM Radio. There is also a DVD, VHS & CD Library. MASTER BEDROOM has a King size Bed, 24' HD TV/Cable, Clock Radio, Telephone with a Private Bath with Walk-In Shower/Handicap Bars/Hand Sprayer and Hair Dryer. GUEST BEDROOM has two Twin Beds, 24' HD TV/Cable, DVD/VCR, Telephone, Clock Radio with access to the Guest Bath with Tub/Shower/Handicap Bar and Hair Dryer. KITCHEN has a Water Filter, Smooth Top Stove, Microwave/Convection Oven with Temperature Sensor, Refrigerator/Water and Ice in Door, Dishwasher, Garbage Disposal, Automatic Coffee Maker, Toaster, Blender, Juicer, George Forman Grill, Crock Pot and all the dishes, glassware and all the kitchen utensils you will need. IN-UNIT LAUNDRY ROOM with full size Washer and Dryer, Iron and Ironing Board. All the Linens and a large quantity of Towels are provided--even your Beach Towels. We have been in the business of providing outstanding Vacation Rentals experiences on Daytona Beach for over 21 Years. Daytona Beach is the best beach in the USA. Great area to vacation since it is close to all of the Central Florida Attractions. Much more to do than other areas. Best of both worlds, on the beach and close to lots of attraction and entertainment. The Sand Dollar Condominium is a Family oriented building. All the conveniences of home with a magnificent view of the Atlantic Ocean. Both Bathrooms have Blow Dryers. Direct Ocean Front on 10th Floor. 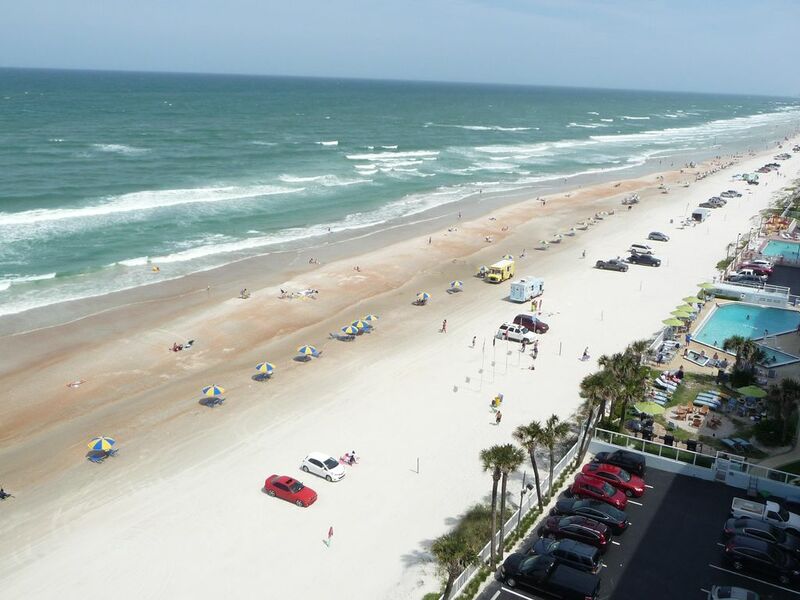 Fantastic view of Daytona Beach and the Atlantic Ocean. Direct Oceanfront on Daytona Beach and the Atlantic Ocean. Large capacity in the unit. 1 Car in Secure Underground Garage. Additional parking on upper deck outside. Full size unit with temperature sensor. KITCHEN with Water Filter, Refrigerator/Ice & Water in Door, Smooth Top Stove/Self Cleaning Oven, Temperature Sensing Microwave, Dishwasher, Garbage Disposal, Automatic Coffee Maker, Blender/Juicer, George Forman Grill, Crock Pot, all the dishes, glassware and kitchen items you will need. 32" HD SMART TV/Cable with DVD & VCR in Living Room, 24" HD SMART TV/Cable in Master Bedroom and Guest Bedroom has 24" HD SMART TV/Cable with DVD/VCR Player. Large Covered Private Oceanfront Balcony over looking Daytona Beach and the Atlantic Ocean. Oceanfront Pool Deck with Hot Tub and Shuffle Board. (2) In first floor Public Restrooms. UNIT: Free Wi-Fi, 3 Phone/Answering System, Unit AC/Heat, Electronic Air Purification System, Ceiling Fans, & Computer size GUEST SAFE in Unit. Ruth and Ralph are amazing hosts. The apartment was meticulously presented with all the amenities to make our stay truly memorable. It really felt like we were vacationing in a world class resort. Well done you two. We will be back. A great place on the beach! Ruth and Ralph are incredibly responsive and considerate of their tenants. They do whatever they can to make life in the condo as comfortable and home-like as they can. We would definitely like to come back and stay in this very well-equipped and perfectly situated unit again! Thank you for sharing your vacation home with us! Wonderful location with a perfect ocean view. This condo has a beautiful ocean view and a view of the Halifax river. It has two bedrooms and two bathrooms, so it is perfect for couples or a family looking to get away. The pool and beach access is a an excellent combination for a perfect Florida getaway. I will definitely rent again next year. The property were very organized, and planned all the details with complete explanations. The condo was very scenic and maintained, I would highly recommend it. The unit also offers garage parking, ant complete security system. The pool and hot tub are very well maintained. The property owners are a pleasure to work with. Thanks for your great detailed rating of our Condo on Daytona Beach. I am sure your description will be very helpful to prospective renters. Very clean property. We loved our stay. The maintenance man was very nice. Glad you enjoyed your vacation in our Condo. Hope you will return to our Condo on Daytona Beach. Have a great summer! New Tanger Outlet Mall. Many great Golf Courses, fantastic Waterpark, Kayacking, Para Sailing, great Fishing of all kinds, Daytona International Speedway, LPGA Headquarters, Amusement Park, Ponce Lighthouse, Daytona Flea Market, Greyhound Racing/Poker Parler, and much more, We are less than 75 minutes from most Central Florida Attractions, including Disney World, Sea World, Universal Studios, Kennedy Space Center, Historic St, Augustine, Golf Hall of Fame & many other attractions. Rates are subject to change until reservation is confirmed. This is a NON-SMOKING with a Maximum Occupancy of 6 people, including children. This restriction will be enforced.